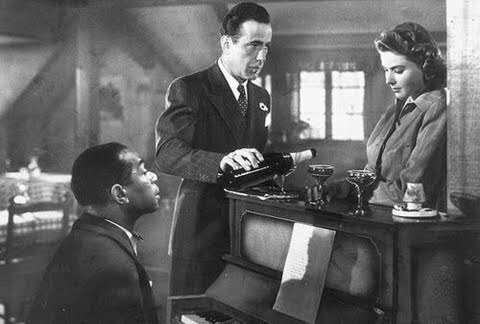 Casablanca might not be the best movie ever made, but it just may be the most perfect. Filled with memorable characters, rich scenes, an elaborate central locale, and sharp dialogue, and centred on a doomed love story set amidst a world war, Casablanca effortlessly delivers the pure magic of the movies. Humphrey Bogart, Ingrid Bergman and Claude Rains defined their careers with their roles in Casablanca. Bogart excels as Rick, the owner of the busiest cafe in Casablanca, emotionally hiding out and pretending not to care for the duration of the war, but inexorably drawn into it when the lost love of his life suddenly re-emerges. Yvonne (Rick's casual floozy): Where were you last night? Rick: That's so long ago, I don't remember. Yvonne: Will I see you tonight? Rick: I never make plans that far ahead. Bergman is simply luminous as Ilsa, torn between her past and present lovers, having to decide between two men, and between her personal passion and her life's most important duty. And finally Rains as Captain Renault, charming his way through the tightrope of maintaining the peace and doling out favours in a nest of supposedly neutral chaos, and waiting to see which side will emerge victorious from the ruins of war. Rains also gets to participate in many of the best dialogue exchanges in the movie. Renault: And what in Heaven's name brought you to Casablanca? Rick: My health. I came to Casablanca for the waters. Renault: The waters? What waters? We're in the desert. Paul Henreid as Laszlo, Ilsa's husband and a leader of the French underground resistance, is billed along with Bogart and Bergman and ahead of Rains, but unfortunately, he is the weakest link in Casablanca. Whether due to the limitations of the role or the actor, Henreid almost comes across as more suitable for a silent movie. His wooden performance is not in the same league as the other three leading stars. 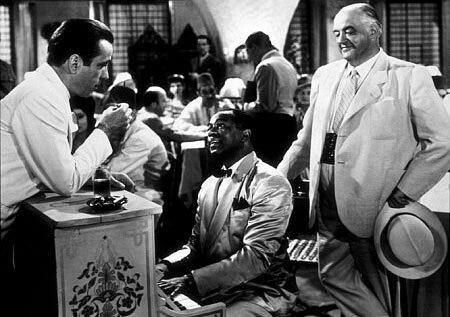 The depth of memorable secondary characters is part of Casablanca's enduring charm. Conrad Veidt as Major Strasser; Sydney Greenstreet as Signor Ferrari; Peter Lorre as Signor Ugarte; Dooley Wilson as Sam the pianist; and Joy Page as Annina, the Bulgaria refugee. None have too much screen time; nevertheless they all shine and make a deep and lasting impression in their few featured moments. Renault (about Ugarte): I'm making out the report now. We haven't quite decided whether he committed suicide or died trying to escape. Even further down the list, minor characters such as the waiters in Rick's Cafe, the pickpocket, and the assortment of desperate figures populating the corners of Casablanca linger in the memory. In terms of locations, Rick's Cafe Americain is one of the most interesting places in movie history. Something is happening in every corner, and there is intrigue at every table, all the time. And if the main room of the cafe is not enough, the gambling den in the back is just as busy and even more entertaining. Adding depth to the exotic locations, Signor Ferrari's Blue Parrot cafe, Rick's main competition, is just as interesting, and much more ramshackle. Renault: I’m shocked, shocked to find that gambling is going on in here. Employee of Rick's: [hands Renault money] Your winnings, sir. The script by Julius and Philip Epstein and Howard Koch is a masterpiece. Sharp, economical and funny, there is a classic line around every corner. The more famous lines are legendary. What is remarkable is that some of the less famous lines are just as good. Michael Curtiz may have been the main Warner Bros. go-to guy to get the job done, and this proved to be a perfect fit for Casablanca. The flashback scenes with Rick and Ilsa in Paris are weak, but in the Casablanca locales, Curtiz adds clever and artistic touches without ever taking away from the urgency of the unfolding drama. Renault (to the gathering police officers): Major Strasser has been shot. Renault: Round up the usual suspects. 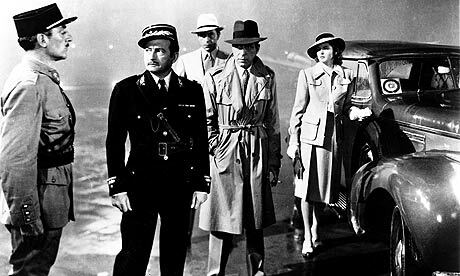 A classic landmark in the history of movie-making, often imitated but rarely matched, Casablanca just gets better as time goes by.